Bora Bora, Moorea, Tikehau... your exotic South Pacific Island honeymoon or vacation awaits. Romance, adventure, culture. The soft coral capitol of the world and the world's friendliest people. London, Paris, Rome, or the Greek Islands... Tour Europe your way with a group, a guide or on your own! Relaxed, stress free resort vacations for an active family or romantic honeymoon. 15 of the best resorts in the Caribbean for an all inclusive honeymoon or destination wedding! Picture the perfect destination, then let us make your exotic, romantic honeymoon dreams come true! I finally made it to Australia’s Outback on a camping safari with Adventure Tours! This type of travel isn’t for everyone but I had a fantastic time and it’s a great option for exploring Australia and New Zealand if you are a young adult or physically fit and looking for an active. affordable, adventure packed vacation. In Australia there are a wide range of itineraries ranging from surfing and sailing on the Gold Coast and Great Barrier Reef to exploring Kangaroo Island, the cities and wineries to camping and hiking in the Northern Territories. And there are more options for New Zealand. All itineraries are rated from 1-3 boots (depicting the level of physical activity), and use hostels or campsites for accommodations. Transportation is usually by van or 4WD. There are three types of camping safaris – primitive, basic and deluxe. Deluxe camps offer spacious twin share tents erected on wooden platforms. Tents are equipped with a light, fan and “proper beds” with mattress, sheets, blankets and pillow. Meals are prepared by a hostess and served family style at picnic tables set inside a screened enclosure. Tea, coffee, juice and snacks are offered throughout the day and wine is included with dinner. The basic camps use a similar tent, but beds are replaced with wooden platforms and campers must bring or rent a sleeping bag, pillow and flashlight. Menus and ingredients are provided, but campers prepare meals and clean up after. Tea, coffee and juice is included but no vino! Shared bathrooms with flush toilets, sinks and showers are provided for basic and deluxe campers. Primitive camps have no tents, bathrooms or kitchen facilities so are appropriate only for experienced back country campers. On my 3 day Deluxe Safari we had 15 campers from all over the world with ages ranging from 16 to mid 60’s. 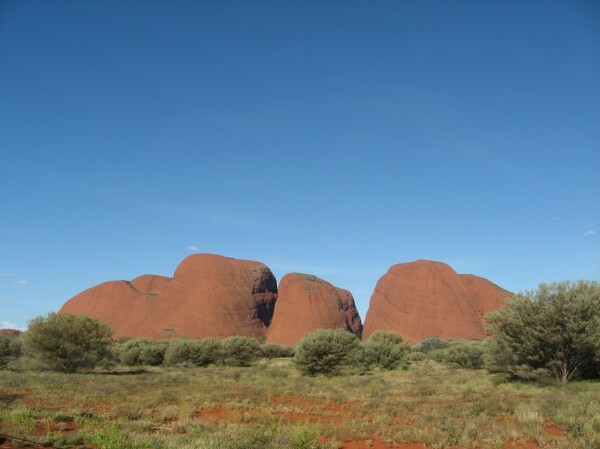 Our itinerary focused on the Red Centre including Alice Springs, the Olgas, Ayers Rock and Kings Canyon. Our adventure began at 6a in a 4WD vehicle headed from Alice Springs to Ayers Rock. Along the way there were stops to ride a camel, visit a working Outback cattle farm and buy an ice cream cone or beer. By mid day we reached Yalara, the town and resort complex nearest Ayers Rock and our campsite for the night. By early evening we were off to see the sunset over Uluru (Ayers Rock) with a glass of sparkling wine and snacks as refreshment. Dinner was a traditional Aussie BBQ with beef and kangaroo steaks, camel sausage (delicious), veggies, a hot potato salad and wine for those that wished. I did and slept very well after all the activity! Another early start was required to see the sunrise at Ayers Rock followed by a visit to the cultural center and choice of hikes. The 6 mile walk around the base of Ayers Rock is highly recommended, however there is a shorter walk and still more may have scaled the rock but weather again eliminated that option. For planning purposes, climbing Uluru is always discouraged by the aboriginal owners for whom the site is sacred. But regardless o cultural sensitivities the climb is prohibited about ¾ of the year due to extreme heat, rain or thunderstorms. After lunch we broke camp and headed for Kings Canyon. En route, our intrepid and outstanding guide Sean went in search of “bush tucker”. For those uninitiated, bush tucker can be anything from an edible plant to a snared rabbit or kangaroo. But Sean was looking for a special treat, a big fat protein laden critter called the Witichi Grub. Now it obviously takes skill to know where within miles and miles of desert to find the proper plant and which root to dig up and slice open to find the prize inside. But for Sean, a true Aussie bushman, that was no obstacle and he quickly found a juicy grub to grill. The rest of dinner was a delicious chicken satay served with rice, veggies and chocolate cake and Claire is a great cook, but I must admit Sean’s appetizer was a scene stealer! Another highlight of the tour was the opportunity to sleep out under the stars in swags. A swag is an Aussie icon, mentioned in the famous song “Waltzing Matilda” and consists of canvas covering a mattress into which one stuffs oneself and all worldly possessions when sleeping in the bush. There is a flap to pull over your head if it rains (it did, but just a little) and this true Outback experience turned out to be comfortable and completely memorable. Our final day included a spectacular but challenging ½ day hike into Kings Canyon. The first section has a 70 degree climb up Heart Attack Hill (really, that’s the name). So in theory, if you get that far you are good for the rest of the hike which includes a series of ladders and plenty of rocks to clamber up and down. The views at the top and along the way are stunning and there is a permanent waterhole called the Garden of Eden where you can swim or relax and cool off in the shade. Which brings me to some planning issues. My trip was in April and more comfortable than it would have been from December through February when temperatures soar and hikes are closed do to high tempeartures. June through August brings warm afternoons but the potential for cold, frosty nights. So for many the best time to explore the Red Center is spring or fall when highs are in the 80’s and 90’s, lows are in the 60‘s and 70’s and rain is infrequent. If this type of outback adventure appeals, some preparation is in order. Physical fitness and appropriate footwear are absolute necessities and you must carry enough drinking water for any hike. Bottled water is readily available and can be refilled at camp and rest stops. Camping gear is not essential although a flashlight and day pack is recommended. A sleeping bag can be rented for $15 for the duration of the tour and optional items like fly nets can be purchased locally. For reservations and questions on adventure travel in Australia please contact Linda@totemtravel.com . Please check back for upcoming posts on my overnight scuba and snorkeling cruise on the Reef Encounter, a rainforest hike near Thala Lodge, the Sydney Bridge climb and an outstanding harbour cruise. You can also click for information on traditional hotels, view photos of the very comfortable Crowne Plaza Alice Springs (an excellent place to clean up after a hiking adventure, or check the latest specials to Australia and New Zealand. Thanks and have a G’Day! Big sale on active adventure travel for 2018! Beach vacations are relaxing but you also want adventure!